The splendid beauty of Brari Nambal lagoon once fascinated King of Kashmir, Budshah, but gross-neglect over the years has now reduced it into a ‘miserable’ cesspool. Bilal Handoo finds out that there are more than one factor that ails the lagoon. Visibly appearing as ‘pungent pool’, Brari Nambal lagoon in Babademb area of Srinagar’s old city seemingly heads towards oblivion, amidst beautification drive in the name of fencing and facelift. Piles of garbage, slum colonies and commercial structures have cemented their place in and outside the lagoon, much to the inertia of authorities! The beautification drive around the lagoon has been started by lakes and waterways development authority (LAWDA) amidst the glaring presence of rubbish, human excreta and drainage into the lagoon round the clock from most parts of city. “Rather than spending lavish on raising one more fence around the water body, it would have been far more better, had authorities contained the huge influx of muck continuously making its way into lagoon,” Imtiyaz Gul, a local shopkeeper in Babademb, says. In any fine day, stench emanating from this water-body is enough to send senses into the state of ‘dejection’. The situation turns even worse during summers. “It is an ordeal for us to live with this continuous stink from water-body here,” Mushtaq Khan, 36, a local told Kashmir Life. It was in March 2008, when civil society raised their concern over the continuous deterioration of Brari Nambal that compelled LAWDA to undertake the dredging in it. But, the much ‘resolved’ task came to a grinding halt, as the local proprietary land holders at the site raised objections against the move. Five years down the line, locals say, the matter is yet to be resolved between LAWDA and landowners which is now slowly taking its toll on the ‘ailing’ lagoon. The land towards periphery areas of lagoon has been put under use for commercial purposes. From Baba Dawood Khaki bridge, vegetable cultivation is going on with full swing and from the Habba Kadal’s Chinkral Mohalla side, scores of slums have been raised that shelter non-locals rag-pickers. The slums on the peripheral areas of lagoon appear much like a mini-slum city. Non-natives and garbage piled in heaps make common scenes here. Scores of rag-pickers with their families dwell inside these slums, besides many lavatories and temporary washrooms have been erected near the bank of water body. “We asked LAWDA to compensate us according to market prices, but instead we are being offered small amount for our valuable lands. This has compelled us to rent-out our lands to non-locals of the sake of survival,” Ghulam Hasssan, 45, a land owner, says. The lagoon was an example of engineering excellence of the great king of Kashmir Sultan Zain-ul-Abideen, popularly known as Budshah. According to historical documents, Budshah was so impressed by the sparkling waters of Brari Nambal that he built Hamams (Bathrooms) for herbal bath on its banks. Many believe that Brari Nambal’s revival is imperative for conservation of Dal lake, as it acts as a conduit to carry its waters into the river Jhelum through old city. The waters of Dal lake, which originated from Dachigam Rakh, flowed to the Brari Nambal lagoon via Nowpora. It took the LAWDA nearly a decade to construct an outflow channel to facilitate the lagoon’s water to flow into Jhelum through Fateh Kadal resulting in further damage to the water body. The lagoon, locals say, started deteriorating in early ‘70’s after the filling of NallahMar canal, a water channel which was pruned and turned into present day NallahMar road. “The water of lagoon was streamlined to NallahMar canal for its movement. Canal closure led to its stagnation as most of the sewage from adjoining areas found its way into it for last thirty years leading to its death,” Mohammad Ashraf, 72, a local cloth merchant in Khanyar, says. Available data reveals that the lagoon has shrunk from five to less than 0.75 km from last thirty odd years. Scientific studies on lagoon have found high amount of Qualiform bacteria and biological species, which speed up the high toxic nature of the basin beyond limits. “Only thirty years ago, the lagoon was a rush pouring spot, as people would visit to see the glimpse of its splendid beauty. But, the present day ugly face-value of lagoon is compelling locals to shift their residences near the water-body,” Ghulam Qadir Shangloo, 56, a junk dealer, who used to live in houseboat inside lagoon before fifteen years ago, says. Experts also put blame on the Sewerage Treatment Plant (STP) of urban engineering environmental department (UEED) for aggravating lagoon pollution that treats 17.8 Million Litres Daily (MLD) sewage of most of the city drains and pumps the residue directly into the basin. “It is true that STP in Brari Nambal treats sewage from drains, but after proper treatment, the same is pumped into the river Jhelum and not in lagoon. So there is no question of shifting blame on STP for lagoon’s deterioration,” Ghulam Nabi Yatoo, an official on duty at STP Brari Nambal, says. But, in its previous reports, the State Pollution Control Board (SPCB) has been claiming that the Brari Nambal STP is not functioning according to the norms. “The STP run by UEED has excess phosphate in its effluent, thereby confirming the fears that Brari Nambal lagoon’s destruction by enormous weed growth is due to sub-standard functioning of the plant,” SPCB report noted. Of late, environmental experts are terming the lagoon conservation as ‘futile exercise’ amidst the free run of organic nutrients into the water body. 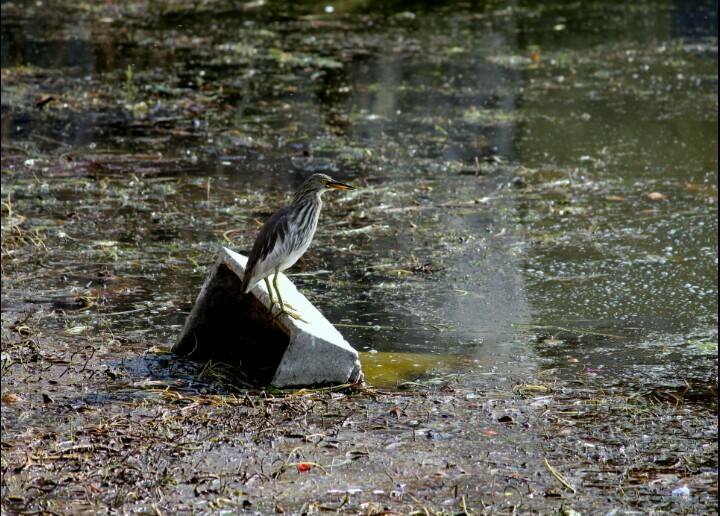 “It is quite obvious that lagoon has turned out to be the cesspool of organic matter, the presence of which has triggered near death of its flora and fauna due to reduced amount of dissolved oxygen,” Prof GA Bhat, an environmental expert of Kashmir University, says. 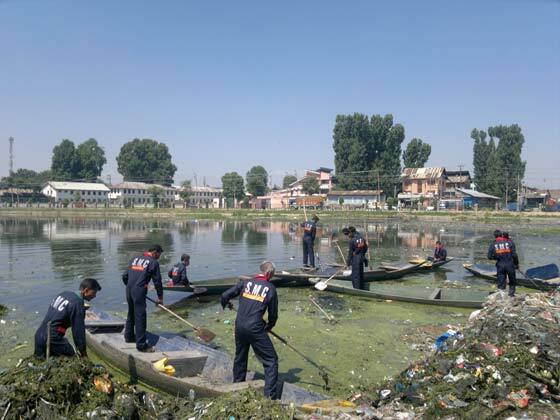 Lately, SMC men were seen clearing muck from Brari Nambal, but given the amount of loss that this water-body has already suffered, the move appears just an eye-wash.
SMC or government can’t clean the place solely. We must come forward and put some efforts to clean not only Babademb but other water bodies of the valley, coz we r responsible for the present situation of these water bodies… Lets not wait for SMC or any other concerned deptts to clean places like this, may be when they will wake up we might have lost all these places.